It was 7.50am on a Tuesday morning, I was walking to work down Whitehall when I made the decision to the call the number I had stored the previous night in my mobile phone. The decision was not at all easy and I had mused with the pros and cons of making the call whilst commuting to work that morning. The call was answered by Ben, an Australian who quickly put me at ease and asked how he could help. After describing my symptoms he said he thought it was probable I had decompression sickness. With a diving holiday only a short time away I had dreaded him confirming what I already knew. I always thought that DCS is most frequently a result of diver error and I had made that error whilst diving at Vobster on the previous Sunday. I didn't feel right on the Monday and started to get a persistent tingling in the fingers. My wife, who is also a diver, doubted my self diagnosis. By the evening my fingers felt distinctly uncomfortable and I strongly suspected DCS. Ben told me I had done the right thing in calling and said I should make my way to the London Diving Chamber at the Hospital of St. John and St. Elizabeth in St. Johns Wood. Doctor Eden would see me at 10.00am and I would probably need treatment. When I arrived Jules Eden was at the door and took me straight to the consulting room, a few tests showed a lack of sensation in my finger tips, the diagnosis - type 2 (neurological) DCS. The prognosis was good, because I had seen a doctor experienced in dive medicine within 48 hours of the incident, but I would need six hours in the decompression chamber immediately with a further one and a half hours the following day. Successively, three members of the staff put me at complete ease about the diagnosis. Firstly I was assured total recovery was likely, not to worry and to think of it as any other sporting injury. In rugby say you get sprained ankles, I had the diving equivalent. Of course as in any sport there are the extremely serious cases, but the majority of even type 2 DCS cases, if treated early, lead to a full recovery. I was to spend the next six hours in the company of Mark, who was to be my attendant within the chamber. A brilliant young man of 29 who has just left the Parachute Regiment, a diver with thousands of dives, a diving instructor, a paramedic, a NCO and now on the team at the London Diving Chamber. I didn't touch the book I had brought to read, we talked, had water, tea, coffee and ate for a fascinating six hours. Once the chamber had been pressurised to 18 metres my symptoms disappeared immediately. Several hours of pure oxygen and stimulating conversation was in fact far better than a day in the office. Ben, Matt and the other members of the team whose names I cannot remember (not DCS related) just a product of age, were unbelievably supportive but they all, especially Ben and Mark talked about the ignorance that surrounds DCS within the diving community. After the session in the chamber on the second day I was given the all clear by Doctor Eden. 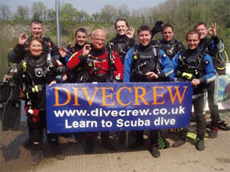 But the reactions from family, friends and divers showed the range of knowledge and emotions that surround DCS. From tears, to anger, to support, to 'What is it? How did you get it? How did you know? ', 'You won't be diving anymore?' Well yes I am and I think many in the diving community should look to AquaPress on the web which has some books on DCS. I now understand so much more about it and the consequences of not seeking professional advice early. Most of you will know because it is in the training that attributes such as age, weight, fitness levels, consumption of alcohol, dehydration, etc., can contribute to your vulnerability to DCS. Well I am 56 and there is not much I can do about my age, I have lost (not as a result of this experience) 1.5 stone since starting diving earlier this year and intend to lose more, I swim between 1,000 and 2,000 metres three times a week and do not drink to excess or anywhere near it. I hope I never have to return to the Chamber again, as a patient that is, but would love to meet any of the team socially. In Sharm last week after a dive I started to feel unwell and the symptoms were vertigo and dizziness, 'hell DCS!' were my thoughts. An early call to the dive doctor dispelled my fears – the diagnosis Rameses Revenge – technical term Egyptian tummy problems – rehydration, see how it goes, a day later back diving. But what I have learnt is better be safe than sorry. My DCS was a result of my error and my inability to sort my buoyancy – maybe now others will realise how important it is – I hope so and I certainly do. You don't just risk injury to yourself but to your buddy and I apologise to mine, James, for that day at Vobster. But please, please, please if you think you have the symptoms contact the London Diving Chamber, they are a great bunch of professionals, but they are also divers and understand you and what makes you tick. Hours of pure oxygen is a real buzz maybe the song 'I can see clearly now' sums up my experience.